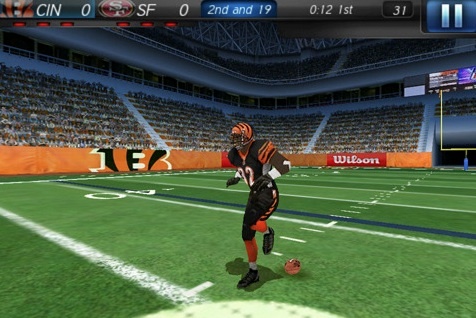 Gameloft's football game can't measure up to Madden. In between covering Madden NFL 11 on iPad, we thought we'd take a moment to look over the competition from Gameloft. 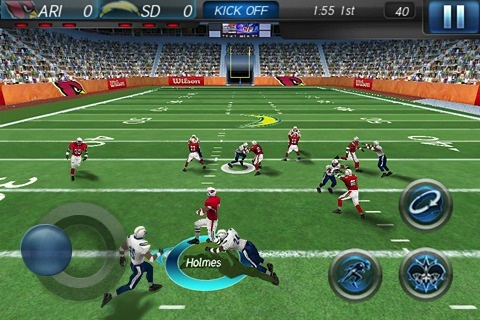 NFL 2011 may not be as recognizable a brand name as Madden, but the company gave it an effort, trying to produce a solid football game for original iPhone and spanking new iPhone 4 owners as well. Unfortunately, all this game has is looks. Let's talk about the presentation. The graphics are very good, nice, crisp and clean, even on an older 3GS. The movement of the players is nice and fluid, and you'll easily recognize specific players on your NFL team, although there is a need for a few roster updates here and there if Gameloft can ever get around to them. The audio is terrific as well, recreating the atmosphere of a real football game right through your iPhone's mini-speaker. It's not as in-depth as Madden's presentation, but for a portable game, it suffices. Sadly, the gameplay is a jumbled mess. While it is nice to call your own hot routes and choose from a variety of plays (including passing and running), nothing works well enough to warrant continued play. Although player movement is accurate, your controls over them are not. Here are a few examples. When it comes to running, someone's asleep at the wheel. In spite of setting up a route, you never really feel like you're in complete control of your runner. Even if you accurately press the right buttons on your iPhone screen (which is already a hassle to do), your players don't react effectively enough. As a result, they plod towards the first down marker with very little input on your part. They run the route and, well, that's really about it. And another thing, who programmed the team to do celebrations every time they score a big play, even though they're nowhere near the end zone for a touchdown? Hey, guys, in case you haven't noticed, there's still a whole bunch of field ahead of you! That brings up passing, and it's even worse than the running game. You pass the ball to open receivers by touching your finger on-screen to your open man, and either tapping it for a quick pass or holding it down for a more powerful pass. This would be a great system if it worked. Sadly, most of the time, your passes aren't read properly, leaving you wide open for a sack or possibly even an interception, if by some miracle the pass gets off. Even if it's just you and a receiver in an open lane, you'll feel as if there's safety glue on your hands, as you can't properly release the ball. There aren't many modes to play around with either, and there's no way to hook up with friends in multiplayer. Seriously, though, if you suggest this over Madden, they may wonder if it's time for a lobotomy. That would be like recommending low-fat yogurt to a banana split. Just forget about NFL 2011. While it looks and sounds like a true contender, its gameplay keeps it from winning in overtime. Maybe next year Gameloft will try harder to get this series back on track. For now, we're moving on to Madden. What's Hot: Looks and sounds great, you can call your own hot routes. What's Not: Gameplay never clicks, no multiplayer, too many celebrations.